This summer, when you stop by for ice cream at the Rose Terrace Café, be sure to look UP—and marvel at the incredible trees above you. 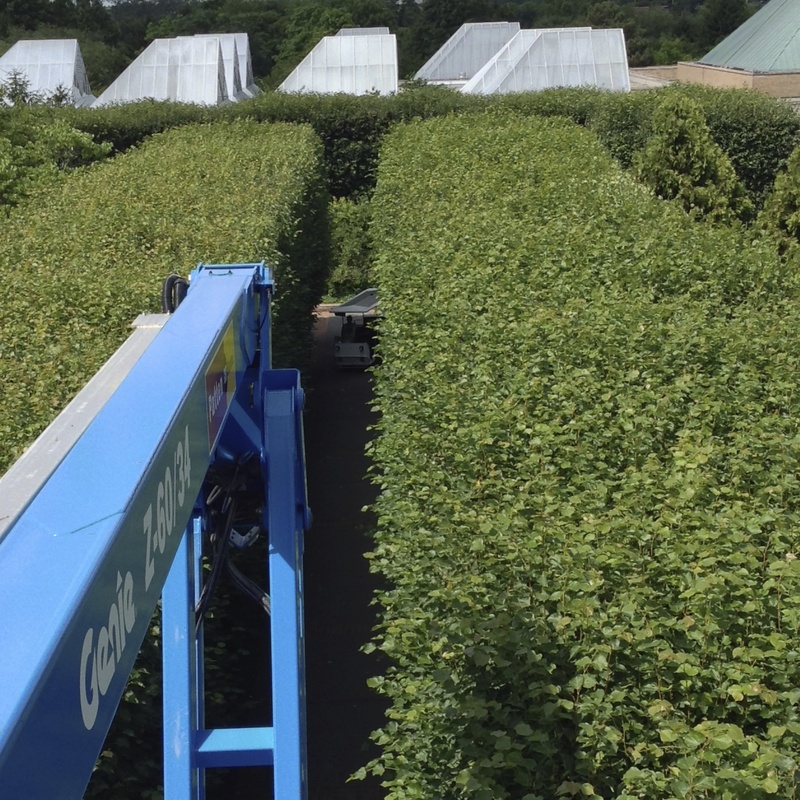 These 28 GREENSPIRE™ linden trees (Tilia cordata ‘PNI 6025’), a cultivar of littleleaf linden, are actually pruned into a 270-foot-long hedge! Couldn’t resist a selfie with Guillermo in the lift! Littleleaf lindens are native to Europe, central Russia, and western Asia. They are relatively disease-resistant and low-maintenance trees. Their dense canopy provides ample shade for a hot summer day, and the heart-shaped leaves turn an outstanding gold color in the fall. They have a very symmetrical conical shape, strong central leader, and can reach a height of over 50 feet when mature—a great landscape tree for the Chicagoland region! Twice a year, working carefully, twig by twig, a crew of four to five staff members from the Grounds Department prunes all 28 trees in the Linden Allée to precise measurements—once in the winter for shaping, and once in the summer for detail grooming. The design is very uniform and creates a formal allée of trees. The sides are pruned at a slight, almost imperceptible angle, and are 4 inches narrower at the top than at the bottom. This allows sunlight to reach all of the leaves, while still visually appearing to be straight, not slanted. 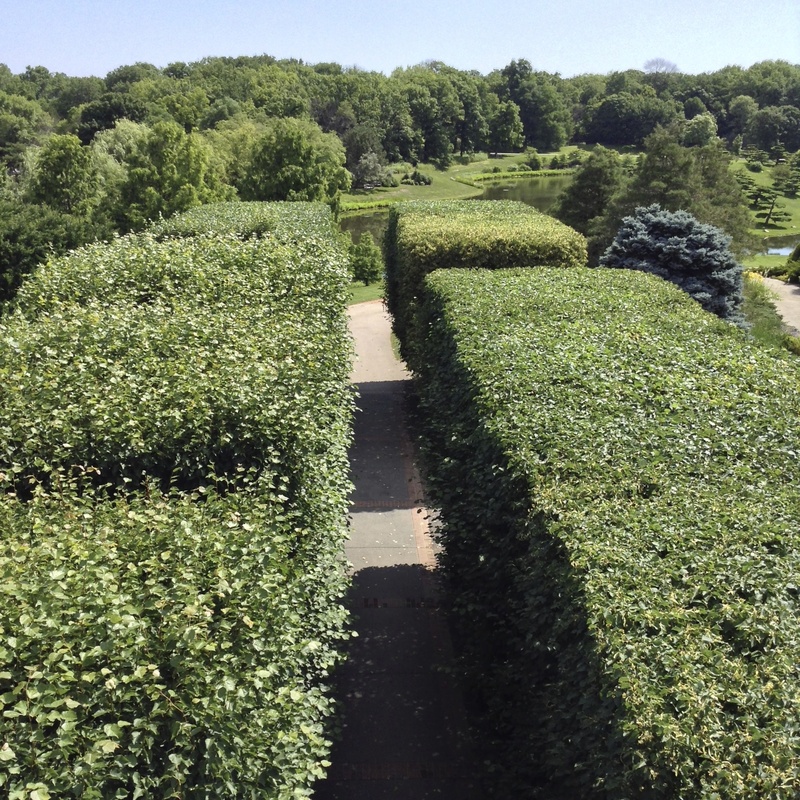 The undersides of the trees are pruned level, and even the tops of the trees are pruned into a perfectly flat hedge shape. Here comes the tram! Time to back the lift out of the Allée again. Taking a break with a view of the Malott Japanese Garden: the right side (and back left of the Allée) after pruning—still more to do! 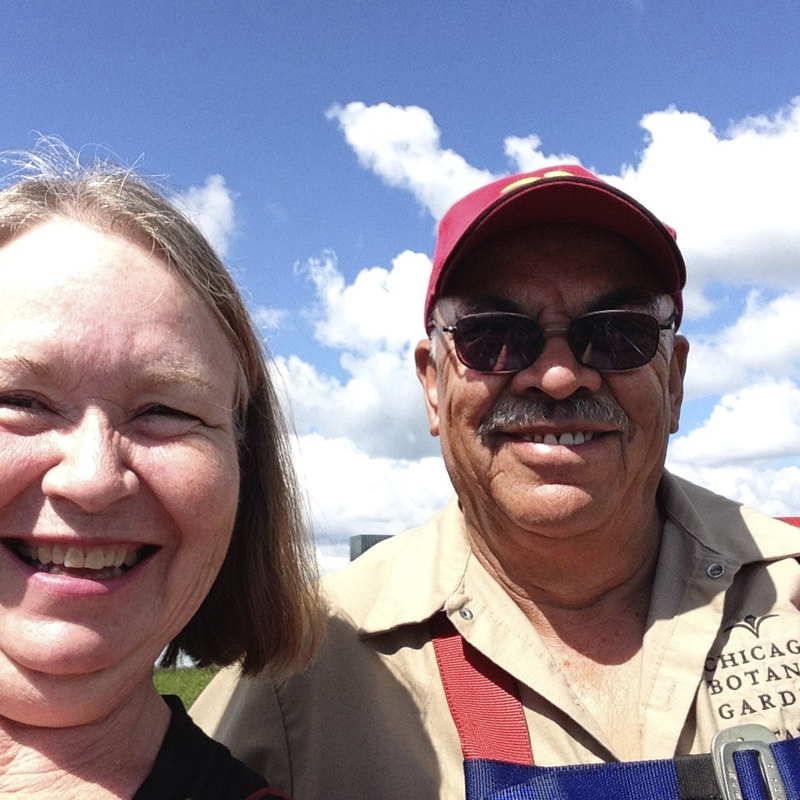 Guillermo Patino, who has been with the Garden for more than 20 years, is the crew leader for this project. He is an expert at maneuvering the large aerial lift in and around all of the trees, as even the back sides of each tree must be pruned. And then, once every hour, he hears over the radio, “The tram is coming!” He moves his giant machine out of the way, allows the tram and visitors to pass, and then at the blazing speed of 2 miles per hour, drives back down to his work area to continue his pruning. An interesting and unique characteristic of linden trees is that they are very tolerant of heavy pruning, making them the perfect candidate for hedging, espalier, and bonsai. This work takes the staff more than 500 hours to complete over a period of two full weeks. A big project at the Chicago Botanic Garden, but the finished product is well worth the effort!